Remember PhotoCop, the cameras installed years ago at several intersections in Minneapolis that were used to capture red light runners and mail them a ticket? A bill that once again would allow their use is up for discussion today at the State Capitol. The House Transportation Policy Committee will meet at 2:15 p.m. to talk about H.F. 847, the bill that would allow Minnesota communities and law enforcement to use cameras to catch red light runners. It is authored Rep. Alice Hausman (St. Paul) and others. "We encourage the legislature to give Minnesota cities an important tool to reduce red light running and increase overall road safety," said Nancy Johnson, Legislative liaison for Minnesotans for Safe Driving. "Traffic safety cameras can help change the mindset of Minnesotans and remind them that red means stop." According to stats from the Minnesota Department of Public Safety, 27 people were killed in crashes a traffic signal in 2011. 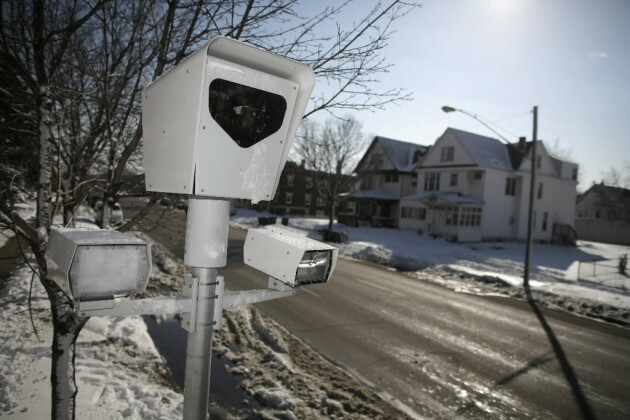 The highly controversial cameras were installed at 12 intersections in Minneapolis in 2005. They operated for eight months and thousands of drivers were captured on video and mailed citations. They were turned off in 2006 when a Hennepin County judge found they violated state law. His ruling was subsequently upheld by the state Supreme Court. That court said the cameras were unconstitutional because the tickets were linked to a driver's license and not the motorist who committed the violation. That has been a big bone of contention because the driver who ran a red light may not be the car owner. In the wake of the court's decision, the city of Minneapolis was forced to refund millions of dollars in fines that it collected. The debate promises to be lively with advocates on both sides of the issue pleading their cases.One group pushing for their use is the Traffic Safety Coalition. A study in 2011 by the Insurance Institute for Highway Safety found that crash rates involving red light running fell by 24 percent in the largest 14 U.S. cities where they are in use. It also found that 159 lives were saved. "Traffic safety cameras serve as a reminder to drivers to slow down, stop on red and ensure the safety of all road users," said Paul Oberhauser, co-chair of the Traffic Safety Coalition, a national nonprofit.